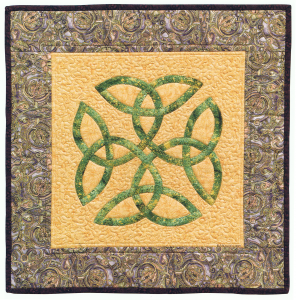 This is the first of a series of posts that will take you step-by-step through the process of creating a Celtic Quilt. We’ll be creating the True Lover’s Knot, one of the beginner-friendly patterns from my book, Celtic Quilts: A New Look for Ancient Designs (pp. 36-29). 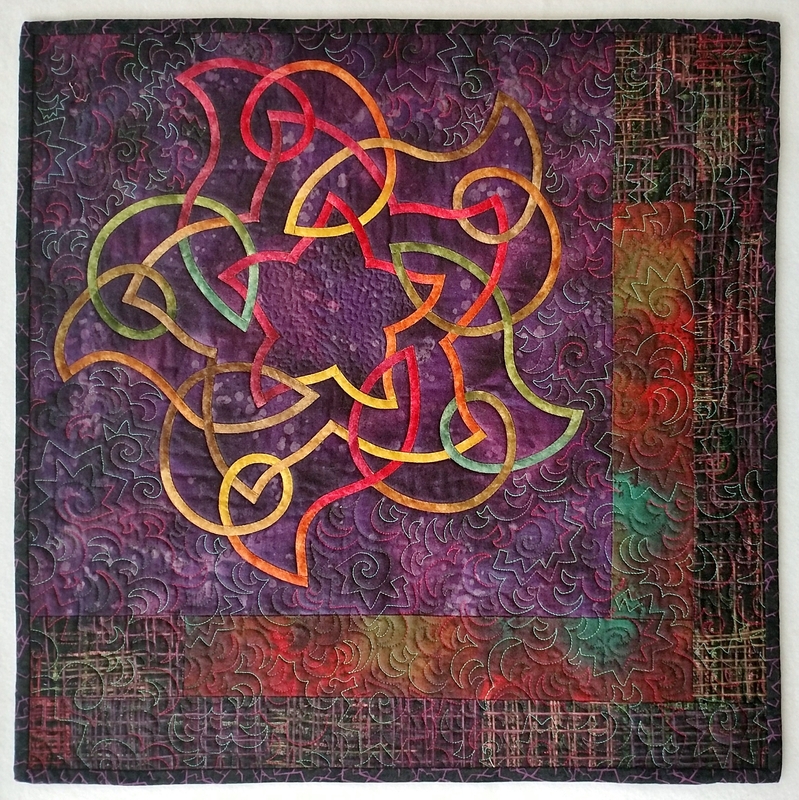 Along the way, we’ll explore how to make a 16″ x 16″ machine appliquéd and quilted wall-hanging (start to finish), a quilted pillow, or a quilt block that can be incorporated into a larger quilt. Understandably, I highly recommend my own book, since it contains complete instructions as well as patterns; but if you have a Celtic design from another source, you may still find my methods helpful. 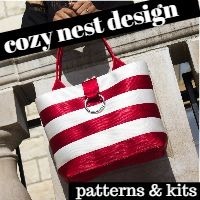 Good quality, colorfast, 100% cotton fabric will be the easiest to work with, particularly since adheres well with various fusibles and adhesives, and holds its shape when pressed. For the knotwork design, I recommend choosing fabrics that have a some visual texture, rather than choosing solid color fabrics. Not only is a subtle print more interesting than a solid fabric, the print will tend to help hide any machine stitching that is supposed to be “invisible”. Quilting-weight cottons are more forgiving when it comes to camouflaging your stitches. Batik cottons are less forgiving, since they are more tightly woven and the stitches don’t sink down into the fabric as easily. The tighter weave also makes it a little more challenging to go around tight curves without creating tiny pleats in the fabric, but I still use batiks if the colors are right. For the background, I recommend something that contrasts significantly with the knotwork fabric. I usually select a either very light fabric or a very dark fabric for this. Starting in with my next post, I’m planning a series of “Sew-Along” and “Quilt-Along” posts for creating the Celtic True Lover’s Knot design from my book, Celtic Quilts: A New Look for Ancient Designs. This block can be finished as a 16″ x 16″ wall-hanging, made into a decorator pillow, or joined with additional blocks to make a larger quilt. To me, Journal Quilting is a handy shorthand way to describe quilting as a vehicle for personal reflection and expression. Although I impose no size restrictions on myself, the pieces are generally on the smaller side, which better lends itself to a sense of immediacy. I often incorporate 3 dimensional elements, hand beading, hand painting, or other mixed media elements in these works. 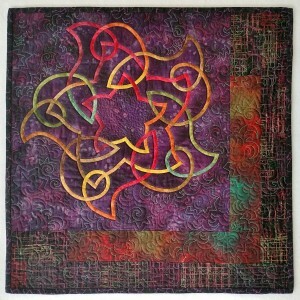 Free motion quilting adds addition texture. 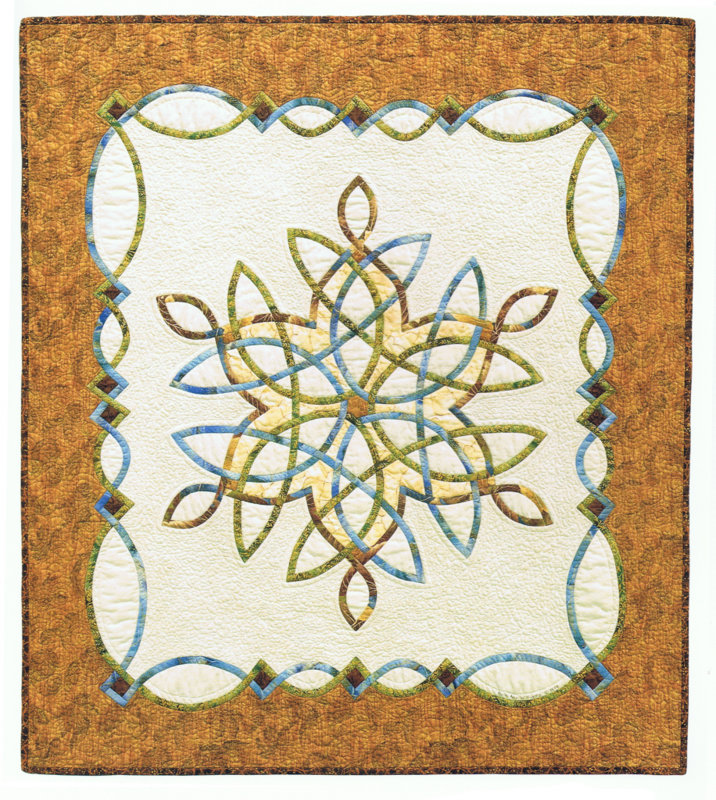 My first book Celtic Quilts: A New Look for Ancient Designs was published in 2000 by Martingale & Co. The following has been excerpted from a lecture/trunk show that I have shared with quilt guilds, quilt show attendees, and various community groups around the country. I’d like to share with you some of the things in my life that led to my becoming a quiltmaker, and ultimately to the writing of my Celtic book. I’m also going to try to answer some of the questions I’m asked most often. So please be patient with me – we are going to tiptoe down what might seem to be a couple of rabbit trails; but I promise that they do, in fact, bring us back to where we want to be. It is my hope that even if you don’t have any interest whatsoever in Celtic designs (how could that be??) Or if you never even look at any of my books, we can find some common ground – it always amazes me how quilters can be so different from each other, and yet again still so much alike. We make quilts because we love to. We need to. It’s not just about keeping warm – it’s about creativity, self-expression, comfort, healing (sometimes even grieving) and expressing love. My own journey has encompassed all of these things. 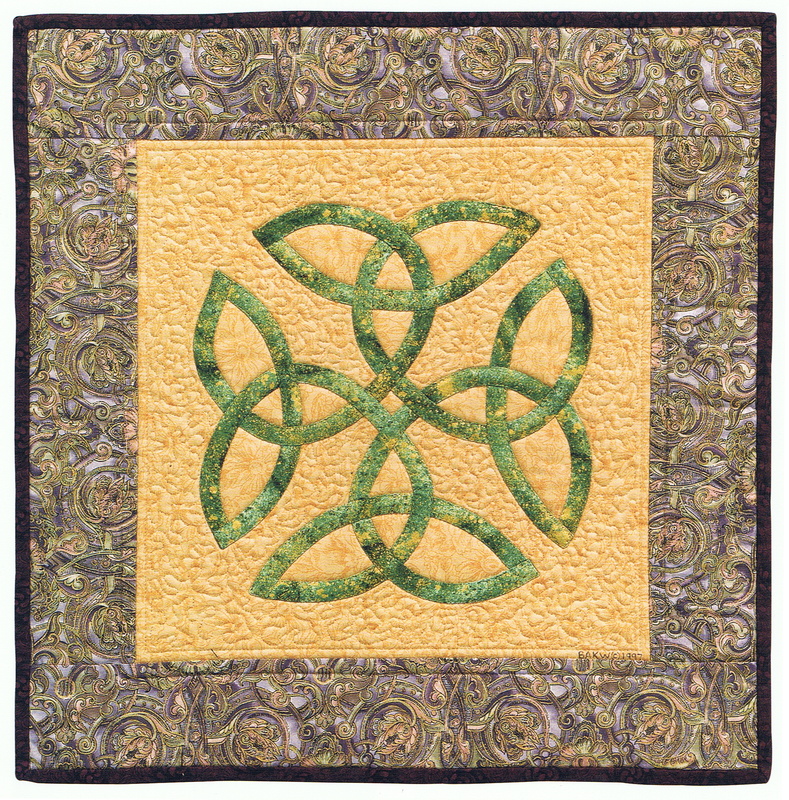 As you will see, my quilts are not intended to be the ultimate in Celtic design. Instead, they are meant to reflect both my own heritage and my fascination with color and line. My book is meant to be a good starting point for anyone who is interested in making their own Celtic inspired quilts – especially those with limited time on their hands who would still like to achieve an heirloom look. The quilts, table runner, pillows and wall hangings shown in this post are all from my Celtic Quilts book. Complete patterns for all but the final quilt shown are included in the book. I no longer have a dedicated FAQ page, so I’m thinking it might be helpful to address frequently asked questions (FAQ) in a series of blog posts. I’ll start with questions related to Celtic-style quiltmaking and my first book, Celtic Quilts: A New Look for Ancient Designs. Are there any rules about what colors or fabrics you should use for Celtic knotwork? 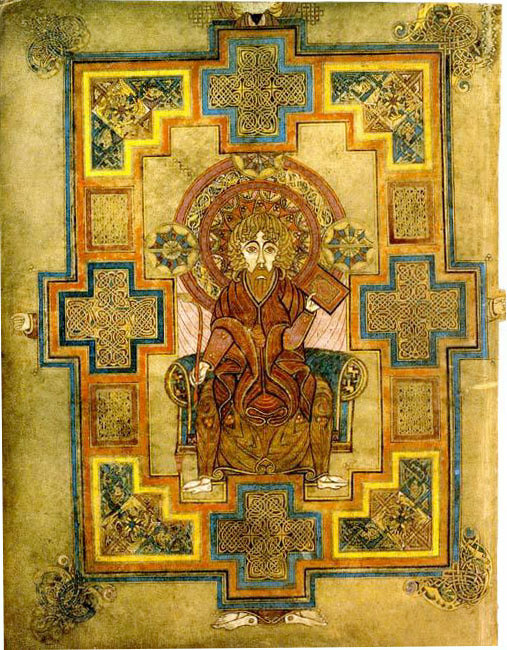 If you look at ancient Celtic manuscripts, you see quite a wide variety of colors being used. In some cases, a given knotwork design is colored in uniformly with the same pigment; in other cases, several colors may be used within the same design. Sometimes the color changes serve to highlight a particular repeating portion of a knotwork design or interlacing border, while other times the color changes seem to have been made at the whim of the scribe. So, there really are no set rules about what colors you can use in a Celtic quilt. Pick what you like best, or pick a combination that is meaningful to you. Feel free to make choices that please yourself!